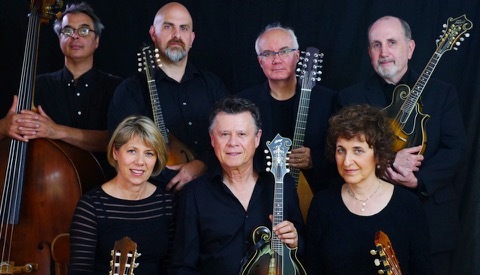 "The New American Mandolin Ensemble shines a fresh light on the Mandolin Orchestra tradition…the group plays wonderful new music…will no doubt become a standard [for] the mandolin groups of tomorrow”. NAME has been acknowledged by the international mandolin community to be the premiere American mandolin ensemble. NAME has not only performed throughout New England, but was featured at the 2014 Annual Convention of the Classical Mandolin Society of America, and was chosen to perform at the opening ceremonies of the Eurofestival Zupfmusik in Bruchsal, Germany, during NAME's 2014 European tour. The repertoire of the New American Mandolin Ensemble consists of original works by the leading contemporary composers for plucked strings, many of which were written especially for the ensemble. These composers include C. Acquavella, C. Assad, J. Bartlema, Jim ten Bosk, R. Charlton, O. Hartford, V. Kioulaphides, A. Kruisbrink, Y. Kuwahara, E. Macadam-Somer, C. Mandonico, M.Nix, E. Stopler, and F. Wallace. They also perform arrangements of diverse modern repertoire, including works by Gismonti, Jobim, Kaufman, and Piazzolla. "The New American Mandolin Ensemble lives up to its NAME! The group's concert performance at the 2014 CMSA convention was one of the best I have ever heard. Brilliant and beautiful contemporary compositions performed by extraordinary musicians with finesse, power and heart. Don't miss a chance to hear this group in person! " To learn more about our members, our music, and what we do, please check out the rest of our website, or contact us. We hope to see you at a concert soon!